Rich experience of construction of different range of Cabinets, Trolleys, Lockers, Pallets, Containers, Bins etc. We have designed an exclusive range of tool cupboard. We have also design the industrial tool cupboard considering the importance of requirements of various tools for day-to-day workshop convenience. We provide cost-effective solution to store all kinds of tools, spares, various parts, day-to-day inventories. We are first to put forth these rich featured and highly structured tool cabinet to general stores, which extensively helps to systematic storage of small parts and units. Our Industrial Tool Cupboards fulfill the purpose to storage of precious tools with systematic manner. These cup boards help operators to make available the tools on demand. 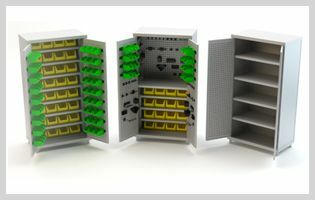 Smart design concept with partitions and dividers; provide maximum comfortable range of cupboards. It is also provided with hinged doors. For the convenient usage of the tools, we provide one more option of the glass on the doors. It is also provided with adjustable shelves. The hinged doors are provided with small bins to categorized arrangement of tools. Our range of tool cupboards is manufactured from the reinforced welded steel sheet. It is supported with the pillar, cross channels and stiffeners. It is facilitates with 180° door opening. The opened door disappears outside the housing which provides maximum access to all stored tools. We also provide perforation cupboard as a sole manufacturer in India. Perforation cupboard is available with perforated panel placed on the doors and inside the cabinet to provide maximum storage options. Big range of hooks is also facilitates for the more storage options for the well arranged tools. Our tool cupboards and industrial tool cupboards are ideally suitable for the heavy items and materials. Adjustability of 75 mm steps is provided for interior fittings to facilitate convenience of users.